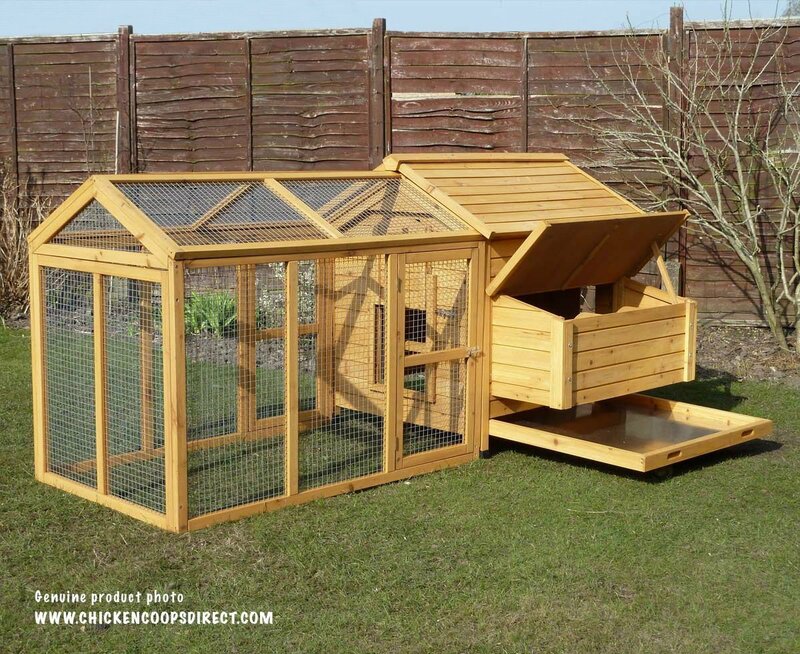 The versatile and feature rich Devon Hen House With Run allows your hens a secure area outside their coop as well as giving you total control of your flock if and when you need it. 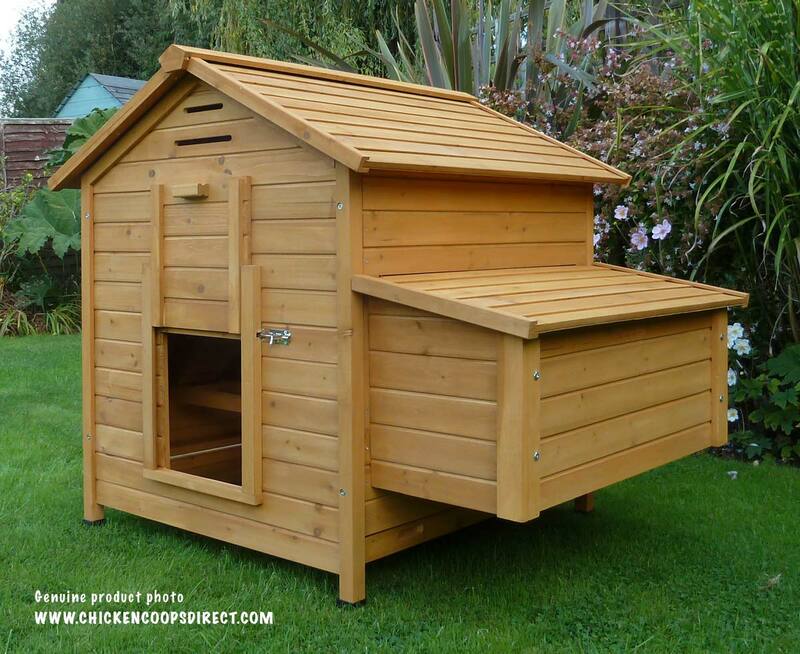 With over 9 square feet of internal space the Devon Hen House itself is able to house up to 6 to 7 medium sized chickens quite comfortably. 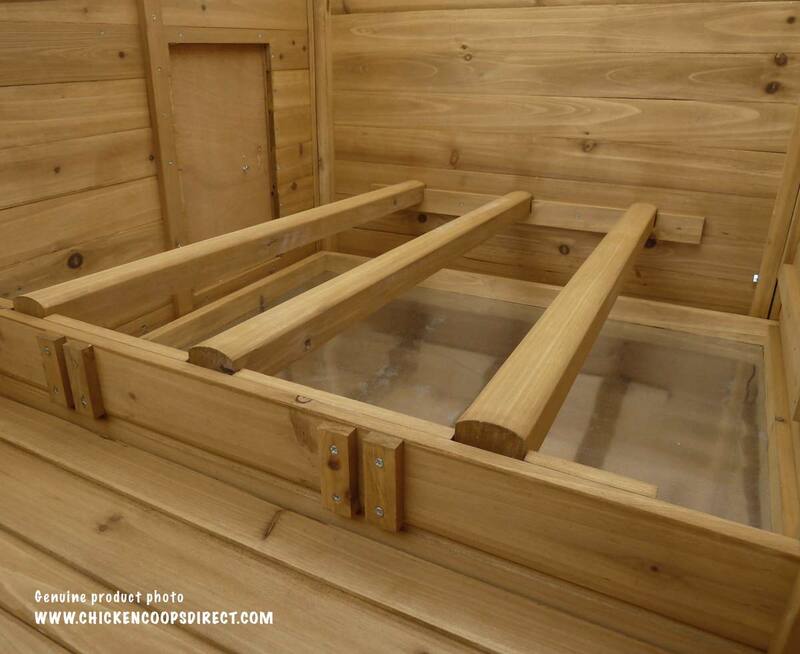 The 11 square ft run can be fixed permanently to the front or back of the coop or simply pushed up against it. 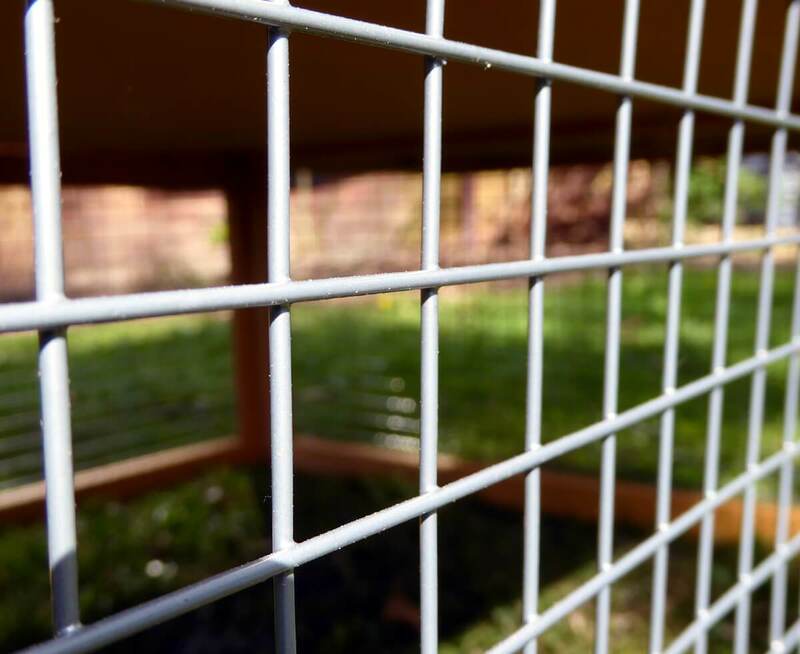 You can also easily extend your run at any stage should you want to keep your hens inside a run at all times or just wish to give them a bit more room to roam. 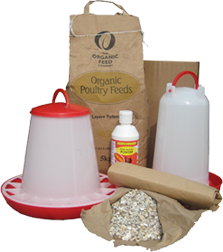 The Devon Hen House is one of our easiest coops to clean thanks to a large fully removable pull-out tray which is deeper than most other models online, so it is able to hold more bulky bedding material. 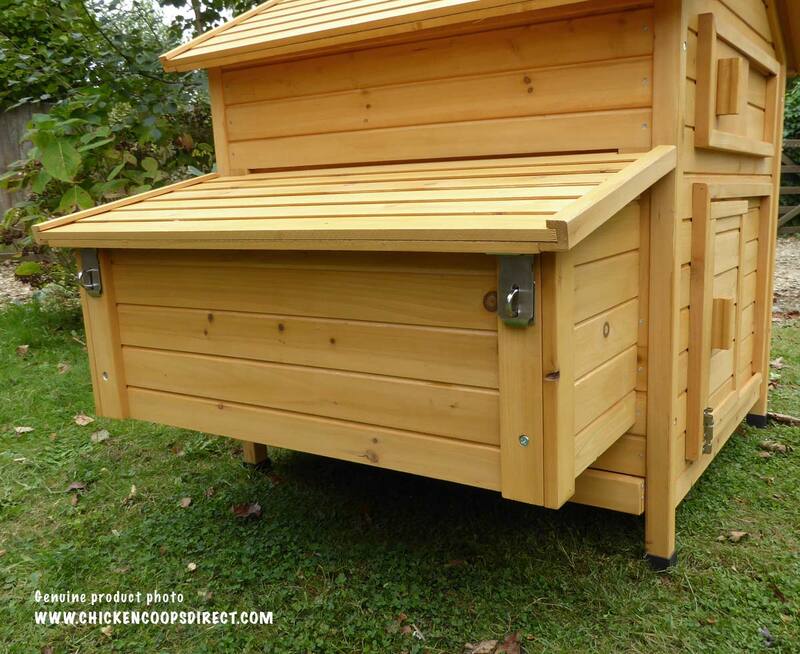 The large nesting box allows you to easily collect your eggs in a matter of minutes without disturbing your flock. It can also be easily unbolted from the side of the house to give you more access to the interior of the hen house for cleaning. 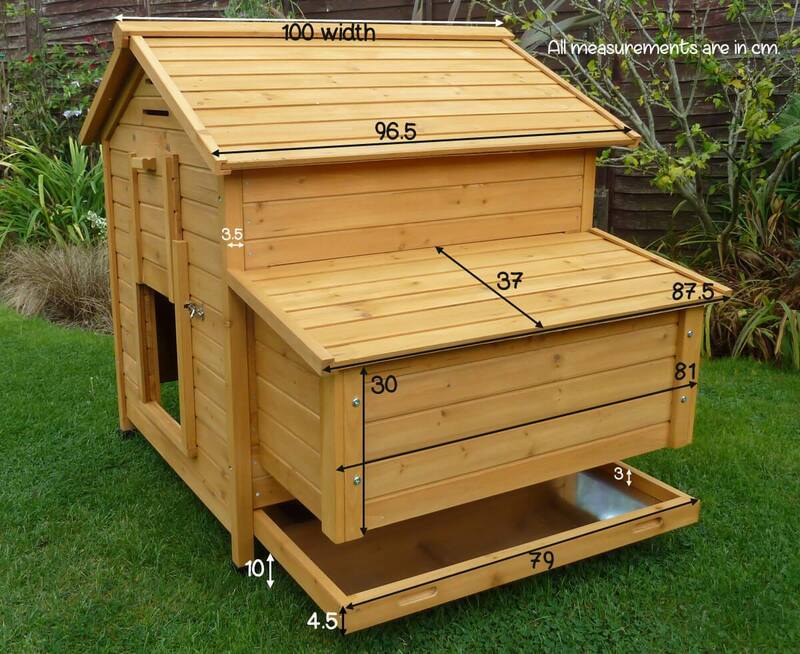 The large nesting box comes with 3 cosy areas which will allow all your hens the perfect place to lay, ensuring that you are rewarded with a constant and fresh supply every morning. Inside you will also see that there are 3 separate and removable perches, positioned high up inside the hen house and giving plenty of roosting room for all your chickens. The front and back panels of the Devon Hen House are easily inter changeable so you can choose whether you want the sliding door entrance or the vertically opening door entrance (as shown above) to face the front. 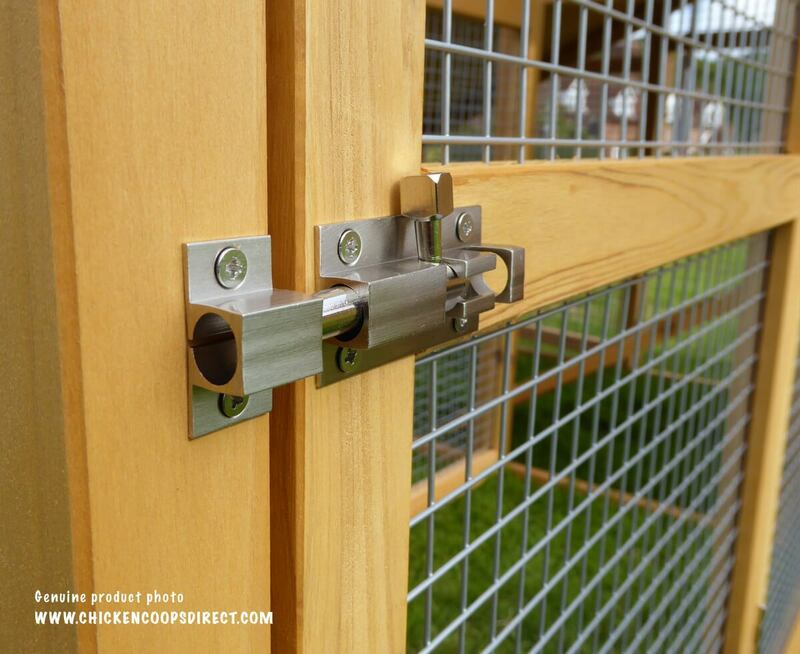 Two large lockable door gives you easy access to either side of the run should you wish to change your chickens' water or top up a feeder with food. You can also fit an automatic door opener to the vertically opening pop hole should you ever want to totally automate the process of letting your hens in and out of their coop in the mornings or evenings. 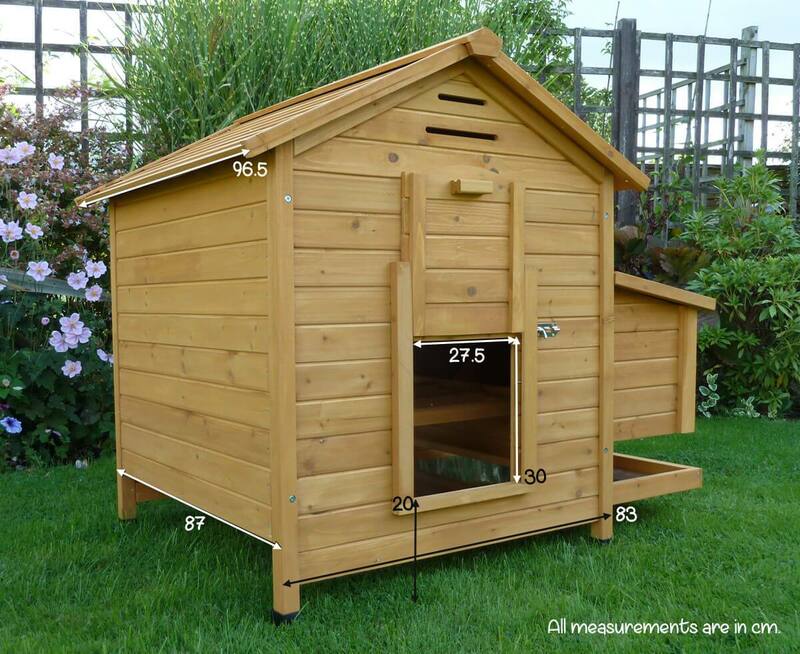 All our coops use 12mm tongue & groove timber supported by strong 35mm x 25mm framework. The wire mesh we use is 1.5mm thick. 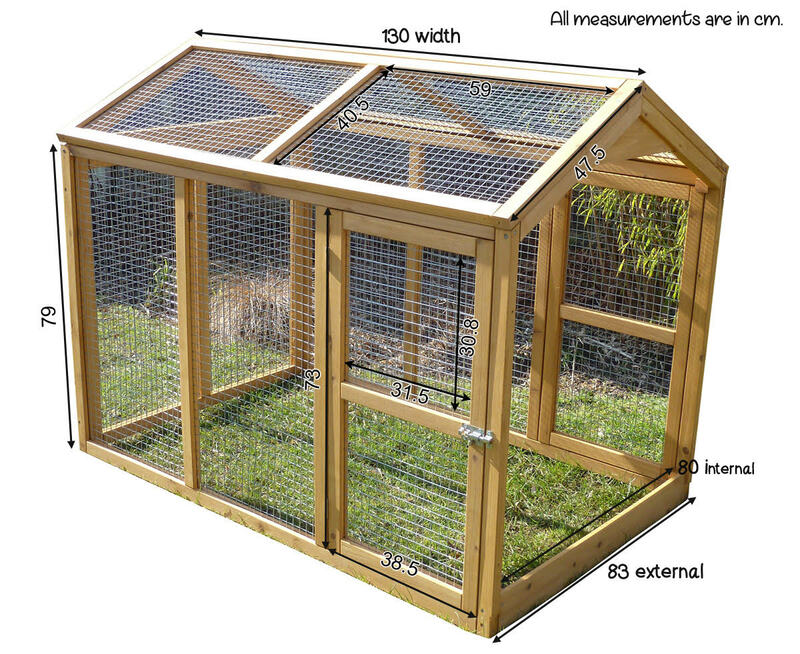 Total external dimensions (in inches): L 88" x W 50.1" x H 42.5"
Total combined area of hen house and run: over 20.5 square feet. External dimension (in inches): L 51.1" x W 32.6"
Internal run dimensions (in inches): L 50.3" x W 31.4"
Box 1 - 108 x 84 x 15 cm - weight: 18.5kgs. Box 2 - 103 x 71 x 15 cm - weight: 18.5 kgs. Box 3 - 135 x 83 x 15 cm - weight: 18 kgs. 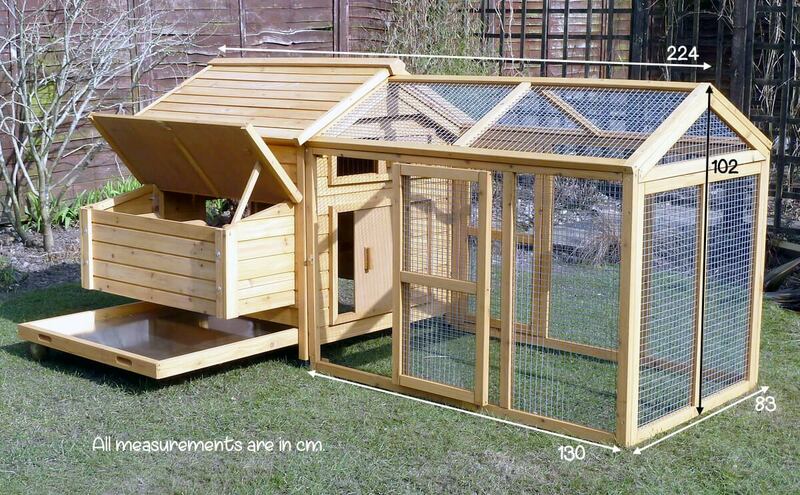 The Devon Hen House and Run is supplied flat packed for easy home assembly. This set comes flat packed in 3 boxes. Instructions are included. All you will need is a small screwdriver and an adjusting spanner. How many hens can the Devon with Run hold? It really will depend on the breed of chicken and the size of the breed and how you intend to keep them. 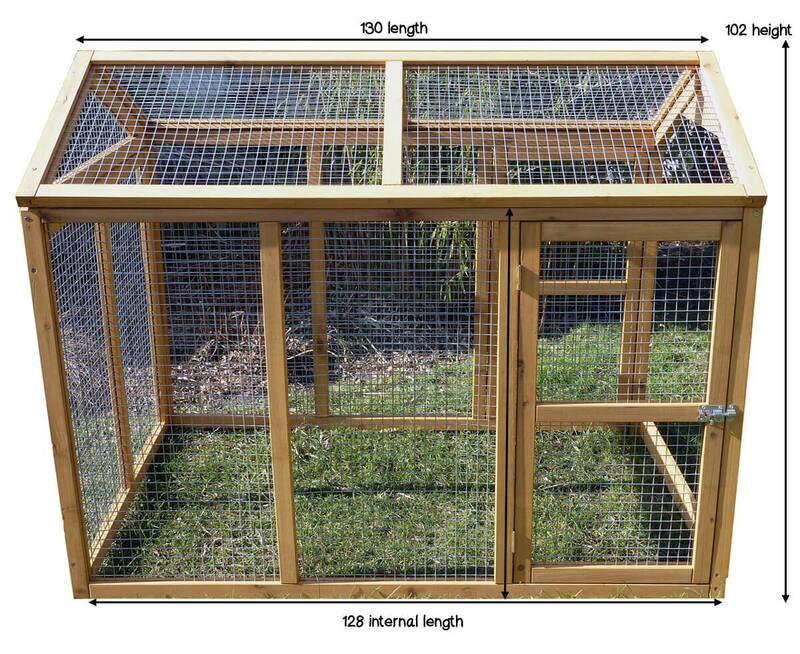 The raised roosting and nesting area of the Devon Hen House will hold 6 to 7 medium sized birds quite comfortably. (Some customers do keep more but we feel 6 to 7 hens is optimal). What is probably more important to consider is the amount of space they will have during the day. If you intend to give them time to roam around your garden then the run space is less of a determining factor and 6 to 7 hens would be perfectly fine. However, if they are to spend their entire day inside the Devon with Run then we feel that 2 medium sized hens or three Bantams would be the amount to keep. 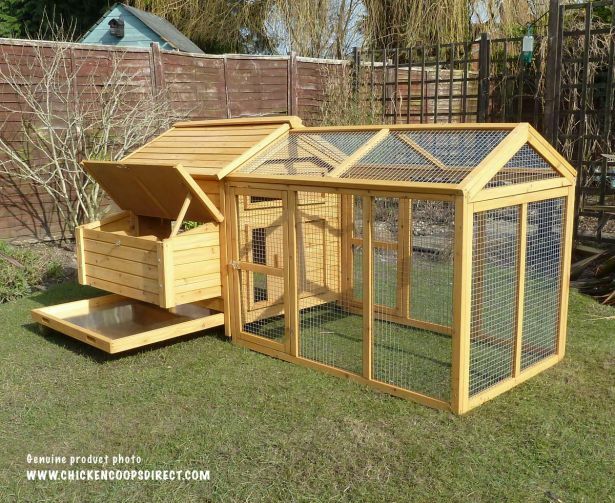 If you are thinking about investing in the Devon with Double Run then you can increase that number to 4 medium sized hens or up to 5 bantams. The benefit of all our coops is that the run can be easily extended at a later date should the need arise and in theory you can add as many run extensions as you need.On a side, note we always recommend that whatever your circumstance and set up that you try and give your hens a few hours outside their coop and run in the late afternoon and early evening. 1. How many hens can the Devon hold? 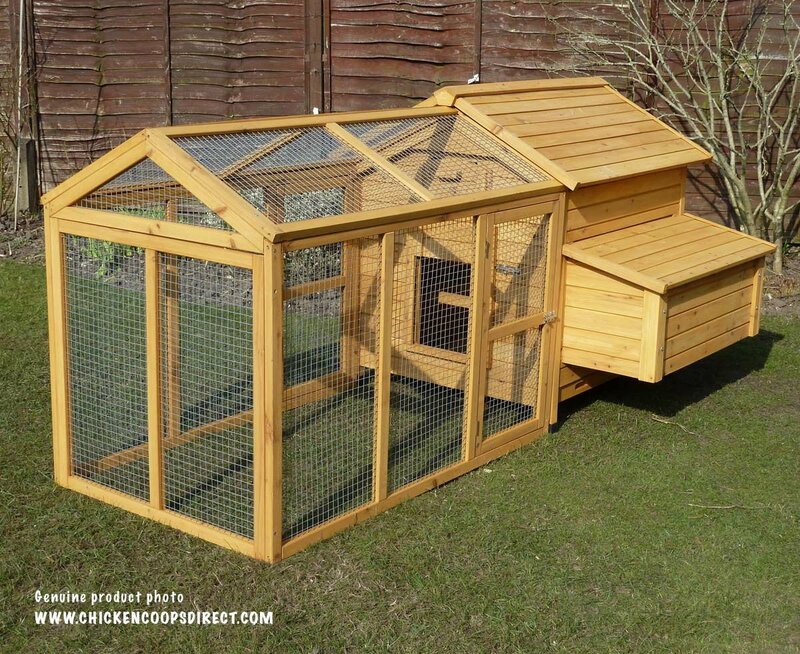 The raised roosting and nesting area of the Devon Chicken Coop will hold 6 to 7 medium sized birds quite comfortably. Some customers do keep more birds inside as there are over 9sq feet of space but we feel up to 7 is a good number. 2. Can I fit an Automatic Door Opener to this coop? 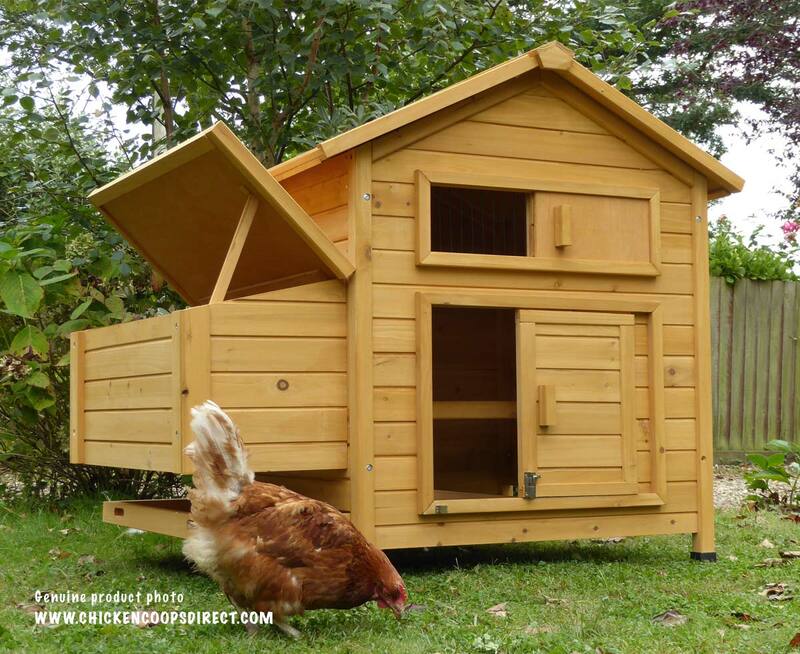 Yes, the Devon Chicken Coop has been specifically designed so it can be fitted with an automatic door opener. We use and recommend this door opener kit which comes with a door opener. 3. Can I have the Devon with a verticle (pop-hole) door? The Devon comes with both a verticle opening (pop-door) and a sliding door. There are two 'front' panels. One has the sliding door and the other the pop hole door. You can choose to face either one in the front. Yes, the Devon hen House comes with a base coat treatment of wood preservative. But as with all outdoor wooden structures in our harsh climate, we recommend that the timber is treated on a regular basis to ensure a long life. If the coop is treated, to begin with, and thereafter on a yearly basis, and is well looked after and cleaned regularly there is no reason why a lifespan of 5 to 7 years or more could not be expected. There are many popular products available with Cuprinol, Ronseal and Wilkinson amongst the better known brands.A lot of customers use and recommend these: Brand Option 1 or Brand Option 2. 5. Can I use the Devon for keeping ducks? While the product has been specifically designed to house chickens a few customers have purchased the Devon for their ducks and the feedback has been positive. 6. Can I add a run at a later stage? Yes, you can add runs at any stage. 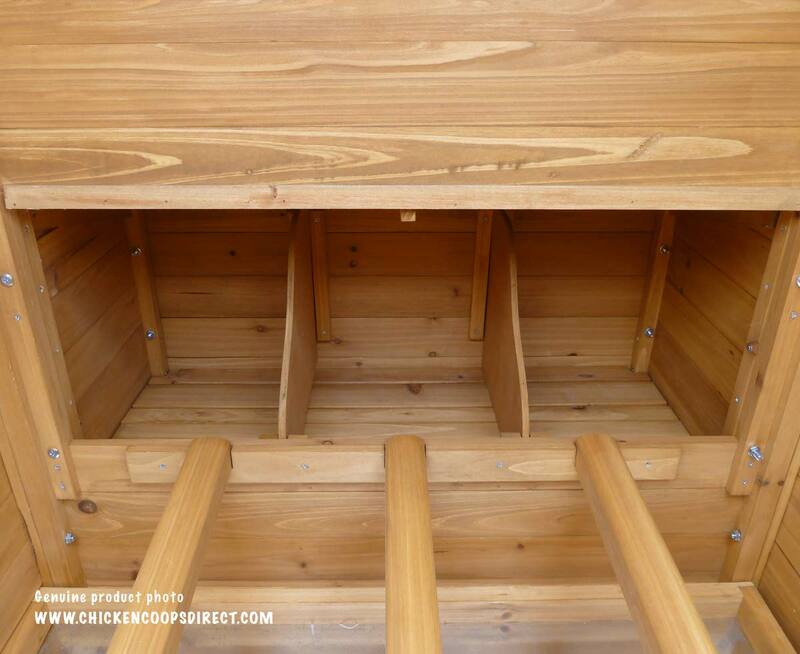 These can be joined onto the front or back of the coop and you can join as many runs together to form as long space as you need. For more info on the Devon Run by itself click here: Devon Chicken Runs. 7. Is the Devon fox-proof?